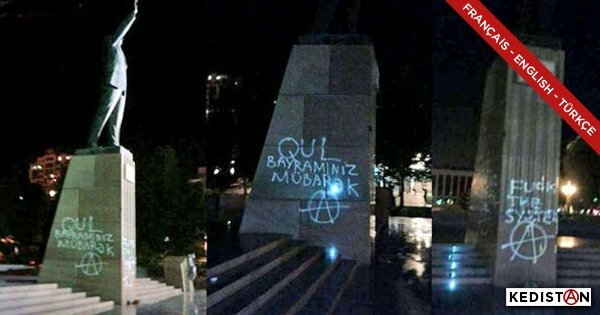 In May of 2016, two of our comrades in Azerbaijan, Qiyas Ibrahimov and Bayram Mammadov, were arrested for spraypainting the monument of the former dictator Haydar Aliev. It was on the night before the so-called „Flower holiday“, a day made up in conmemoration of Haydar, the father of the current President of Azerbaijan. Nonetheless, as the charges for spraypainting would not have been very high, more than 1 kilogram of heroin was planted in each of our comrades‘ homes. They were processed on different trials. Qiyas has already been sentenced to 10 years of prison, his friend Bayram Mammadov is still on trial. From Azerbaijani comrades we received the text of Qiyas‘ speech in front of the jury, him being interrupted regurlarly by the judge. In support of his case, we made an audio version of this speech and the judge’s comments. You can find the speech in the attached document. You can download the audio at: archive.org (wav | mp3 | ogg). You‘ll find a previous interview in English on our blog. More information is to be found in this article.